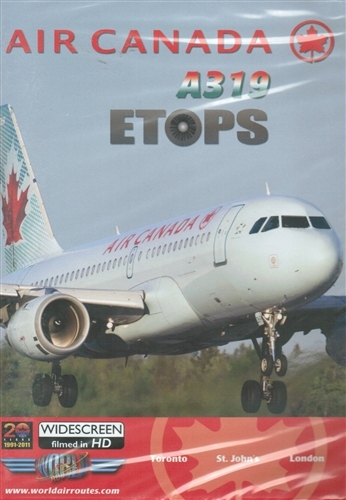 Operating an Airbus A319 across the Atlantic is a very rare occurance however Air Canada has 2 A319s configured for ETOPS operations and they are servicing the Newfoundland to London route during the summer season. 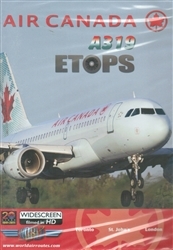 We were not only lucky enough to be able to present this operation to you but we actually cover a check ride in which a Captain gets his ETOPS qualification so you can discover everything about ETOPS in details with 2 pilots eager to present every aspect of this sort of operation to you. Bonus is a flight in and out of Heathrow captured both in the cockpit and from the cabin with a great wing view. Many other features make this yet another fantastic Air Canada program! Cockpit filming using 4 cameras for multiple views on takeoff & landing! Run time is about 270 minutes. Format is NTSC DVD and region-free.